On Thursday, August 13, 2015, ISPOSSIBLE IN TECH, a technology staffing agency based in New York City, co-founded by Tiffany Roesler, Nana Ekua Brew-Hammond, social commentator, author of Powder Necklace, and the 2015 opening speaker at TEDcAccra, and Erikan Obotetukudo, a child of two Nigerian immigrants, who made a career out of researching about, investing in, and contributing to Africa’s growth as a continent, came together to host the first Africa 2050 event at Palantir Technologies. Africa 2050 was born, designed, and held to inform the public about the immense technological potential of the youth population within Africa, and educate the world about the ways in which we can all contribute to the growth, prosperity, and advancement of its population. Currently, Africa is projected to be home to approximately 40% of the global youth population and while “Africa Rising” is now an established buzz word amongst economists, much of the world is still in the dark in terms of the technological advancements taking place there, as well as the technological challenges that are preventing the African population from reaching its maximum potential. By educating the public about the current state of Africa’s technological affairs, together, ISPOSSIBLE IN TECH, Nana Ekua Brew-Hammond, and Erikan Obotetukudo hope to increase the number of people actively participating in and contributing to Africa’s growth and prosperity. In August of 1995, Ghana became the second sub-Saharan country in Africa to have full internet connectivity, but usage was limited due to its cost. As of December 2014, there were nearly 5.2 million internet users in Ghana. There are now more internet users in Africa then there are in North America. Because Africa is home to the second largest population on the planet, there are currently over 268 million internet users in Africa alone. Out of these 268 million internet users, 52 million are on Facebook, and the country of Tunisia boasts one of the highest percentages of users—a whopping 31% of its 11 million inhabitants are on Facebook. Further, Ghana’s cellphone market predates its internet market by three years, as it had established telecoms by 1992. And though the use of smartphones is less frequent than traditional cellphone usage in Africa, Groupe Special Mobile Association predicts that more than 500 million smartphone users will reside in Africa by the year 2020. Finally, with a current population of over 1 billion people that is expected to double by 2050, Africa is soon to be home to 1 billion people under the age of 35. One of the first topics of discussion at Africa 2050 was how conducting business in Africa differs from conducting business in the United States and how those differences and challenges can be mitigated. Danielle Kayembe noted that it is incredibly difficult for a woman to conduct business in Africa because in many countries women are still view much differently than men. Therefore, the way she said she learned to overcome this challenge was by adopting a practice of “partnering with women and making contracts with men”. By establishing firm contracts with men, she has found that she can better trust these business relationships and more successfully work with them. In a slightly similar vein, Chika Umeadi, a young male, noted that in the United States, young adults are revered for their technological savviness, innovations, and inventions, while in Africa, young age is viewed as a lack of experience and therefore untrustworthiness. Therefore, Chika adopted the practice of bringing older men with him every time he seeks to make deals with Nigerian men, as their presence in the room brings him more respect. Chika also noted that there is a paralyzing fear amongst African technologists and entrepreneurs of having their ideas stolen. In the U.S. people are encouraged to talk about their ideas to expand upon them and better them; the exact opposite is the case in Africa. Chika stated that Africans’ fear of having their ideas stolen causes these brilliant minds to keep their ideas locked away in their own heads, rather than proactively trying to bring them to life, thus hindering their personal and continental development. Another incredibly important topic of discussion that took place at Africa 2050 was regarding the presence of tech moguls in Africa and their limited access to media visibility. Rita Kusi stated that one of the biggest problems facing African inventors is comparison; people are constantly asking: Who is the next Steve Jobs? But you can’t compare a native African inventor or entrepreneur to an American because they face incredibly different problems. In Africa, the problems for these entrepreneurs are often simple, yet devastating, as they face issues like network connectivity failures almost daily. The continual comparison of African technologists and American technologists is an oversimplification based on their career field. Instead, Rita stated, we must think of how we can improve Africa as a whole to ensure that the continent continues to grow in the right direction. Within the same discussion, Anie Akpe noted many incredibly powerful and impactful inventions that have come out of Africa that aren’t receiving nearly the media exposure they should be, especially considering their significance. 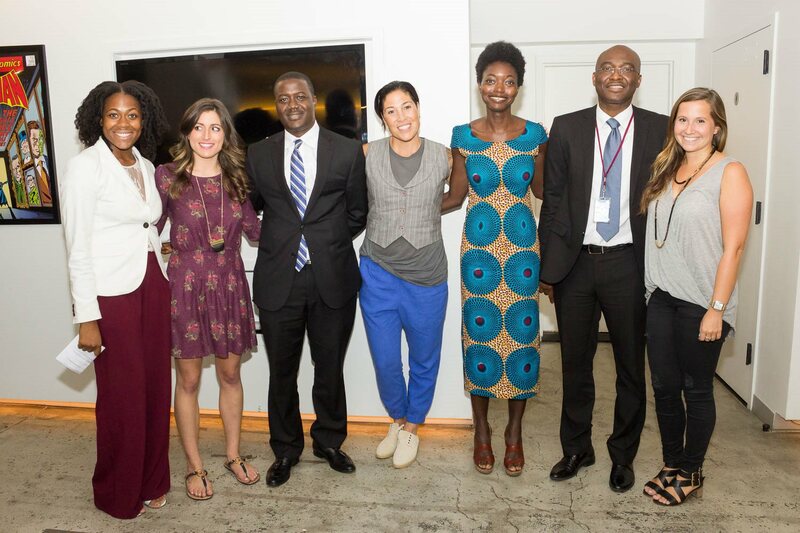 In her discussion, Anie brought light to a group of Ugandan innovators who founded the app Matibabu, which enables doctors to test patients for malaria by using a smartphone and a customized piece of non-invasive electronic scanning equipment to determine if they have the disease in roughly one minute. All over Africa, innovators, technologists, entrepreneurs, and inventors are creating life-changing and life-saving health-oriented apps. The greatest issue these amazing minds face is getting their ideas and their inventions the media exposure they need. And that’s where we—the internet-obsessed, smartphone-savvy public—come into play. Finally, Erikan raised what was one of the most important questions of the night: With Africa technologically advancing at such a rapid rate, how will this benefit Africans in 2050? In response to her question, Chika noted that more money often brings more problems. But he went on to state that with more problems comes the opportunity for entrepreneurs to find solutions, and that is why there needs to be an incredibly intense initiative to educate the youth population within Africa about technology. Moreover, Danielle noted the importance of the African ecosystem surrounding this technological advancement in three particular sectors: Government, Education Systems, and Knowledge Transfer. Danielle noted that the governments are quickly realizing the ways in which they can support this technological advancement to reach new horizons, universities are beginning to train people to gain the skills they need to build a better infrastructure of developers, and groups of innovators and founders are already contributing to knowledge transfer by sharing their insights through podcasts such as TBN. Just as Tiffany quoted Aristotle during her introduction to the event, his wise words must be stated again: just in the middle of possibility and reality lies Africa 2050.